The Minnesota Intercollegiate Athletic Conference (MIAC) has long been dominated by four schools: St. Thomas, St. John’s, Bethel, and Concordia. It has been a stranglehold that has seen some other teams make waves for stretches of time but, inevitably, the four powerhouses soon resume their place as the standard bearers of the conference. However, an upstart school that hasn’t had a winning record in almost two decades is looking to change that. 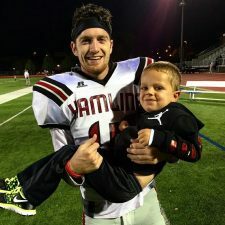 Hamline University has started out the season 4-1 and, entering their toughest part of the schedule, they are looking to change the course of the school’s football program, thanks in large part to a group of talented seniors led by defensive back Zach Schwalbach. It is not surprising that Zach Schwalbach would love the sport of football. Sports were something that the family, as a whole, spent a lot of time doing, and so joining this particular sport seemed like it was a perfectly natural fit. In the second grade, Zach got his first taste of the organized game when he joined a flag football team. That set a pathway of him desiring to get out on the field as often as he could. 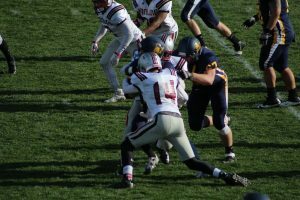 He loved the sport as well as playing baseball and basketball, but realized that if he was going to continue to play a sport in college that football was his most likely option. Football may not have been his favorite sport, but Zach was performing well on the gridiron. He played both wide receiver and defensive back but liked the feeling on defense much better. It was more to his liking and he found that each year he was exclusively playing defense by season’s end. His reactions proved to be quite good. In his senior season, Zach recorded 24-tackles in 7-games and picked off three passes. He helped the team to the section playoffs where they lost in the first round, but he performed well in the hard fought affair. His play on the field and his success in the classroom brought a lot of interest from colleges and universities. Zach Schwalbach had the choice of attending some very prestigious schools, but he narrowed his choices to a few. The first two options were an interesting bipolar weather situation. Zach really wanted to go to Hawaii, but his parents were not too keen on the idea of paying $800 every time their son wanted to come home. He also looked at going to school in Duluth, MN, but the thought of having to use the tunnels to get to class six months out of the year to avoid frostbite left a chilly impression on him. This left Zach with two primary options: Hamline and Luther. His brother was already attending the Iowa school, and many thought it would be natural that he would go there as well, but his visit to Hamline really made the selection an easy one. 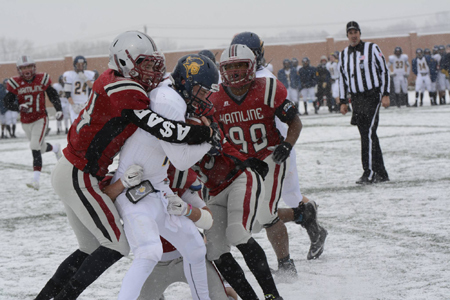 Zach Schwalbach would start his academic and athletic career at Hamline in the fall of 2013. The Pipers were coming off a 1-9 season and were undergoing a coaching change as Chad Rogosheske was named the team’s new head coach and Chip Taylor, the team’s current head coach, became their defensive coordinator. The challenge to turn the program around was a daunting one for sure. Not only had they won just one-game the season before Zach arrived but had won just two in the prior three seasons. 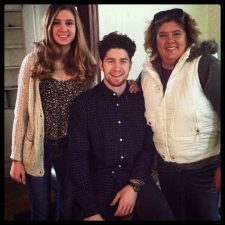 It was at that time that he made a commitment to want something better for the school that he was going to be calling home for the next four years. That may have been the objective for Zach, but his first season was a major struggle. The team went 2-8, which was an impressive feat considering it took them three seasons to attain that many victories prior to the new coach arriving. However, Zach admits that he struggled mightily his first year on the team. In nine-games Zach made 28 tackles. It was not an awe-inducing start, but still a solid one for the freshman. The next season those numbers would improve mightily. Zach finished second on the team with 71-tackles and had 2-interceptions as well. It was a great season but, he admits, his teammates were still a little leery. Zach did not regress in anyway in his junior season. He still finished second on the team in tackles (59), but a shoulder injury had limited his ability to practice entering the season, and so it took a little bit of time before he was at full speed. The junior still made 2-interceptions and teamed with Hill to make one of the most dominant secondaries in the MIAC. This season Zach is having another outstanding season. He is tied for first in tackles through five games (37) and already has 4-interceptions. He is just five away from Chris Nylund’s 1993 record and, while not really interested in individual achievements, he would like to have that record. In his famous speech, Martin Luther King, Jr. said: “I have a dream that my four little children will one day live in a nation where they will not be judged by the color of their skin but by the content of their character.” It is the content of the character of Zach Schwalbach that really makes him stand out. As a senior he is embracing the expectation of leadership and uses his natural talents to help to improve the play of his teammates. 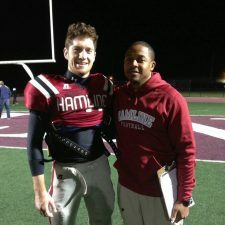 It is easy to see that his helping the younger players to grow to become better players on the field and even better men off is a role that he is loving even more than picking off a pass or making a bone crushing tackle. This has also meant doing all he can to help his new head coach. Chip Taylor took over as the Pipers head coach this season, but still holds the position of defensive coordinator and defensive backs coach. With so many hats to wear on the field and a ton of new administrative responsibilities, the coach’s time is at a premium, and so Zach has made it part of his responsibility to help direct the defense. It is a responsibility that he is embracing not only because of his position as a senior, but also because Coach Taylor has become one of the people that he has come to admire most. It is not just being older and his sense of duty that makes Zach such a good leader. He has also been able to take his struggles that he had as a freshman and use them as a teaching tool to help the younger players learn. The most interested part of the senior is that when one thinks of safeties in football the names that come to mind are Ed Reed, Cam Chancellor, and Ronnie Lott. Players that seemed like they would drop the hammer on their own child at a father-son game. Zach’s character is not an angry one. He is actually a very kind-hearted guy with a real positive spirit. This requires him to take on a new persona when he crosses the lines. 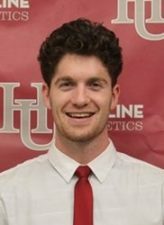 The Hamline Pipers are 4-1, the best start the team has had in nearly two decades and they already equaled the number of wins that they had in each of the last two seasons. The 14-wins the team has over the last four seasons is the best four-year period since the 1990s. With the way that the team is progressing Hamline University won’t be saying that their last football conference title was 1998 for long. Players like Zach Schwalbach have helped to turn this team around. They are men who have taken their talent, intellect, and commitment and used them to lay the seeds for what will likely be a Pipers football program that will making noise in the MIAC for many years to come.